Andrew Goodman’s business savvy evolved at an early age by following in the footsteps of his parents Larry & Paulette. His passion and creativity can be found in every venture and endeavor he’s ever pursued. After revolutionizing the dining scene in San Antonio with his acclaimed restaurant FEAST , Andrew has once again set tongue’s wagging with his latest triumph, Rebelle. In the entirely reimagined St Anthony Hotel he has transformed what was once a long ago neglected space into a dazzling dining room that’s equal parts old Hollywood glamour and new plush elegance. A California Native, Stefan Bowers’ passion for cooking began during his five year Naval enlistment as a (SAR) Search and Rescue Swimmer. According to the chef he “logged a 1000 flight hours in the back of HH-60 Helicopters reading cookbooks.’’ At the conclusion of his enlistment Stefan was introduced to two sisters from Positano, Italy. This transpired into a yearlong apprenticeship under Chef Katarina Di Luccia of Trattoria Positano in San Diego, Ca. In 2003 with the desire to attend culinary school, Stefan and his wife DanCee Bowers made a blind move to Houston, Tx to attend The Alain and Marie LeNotre French Culinary Institute. While in Houston he worked at Restaurant 17 in the Sam Houston Hotel under Chef Jeffery Armstrong. It was in 2005 that Stefan moved to his wife’s hometown of San Antonio and took a position at the acclaimed Lodge at Castle Hills with local Chef Restauranteur Jason Dady. A year into his stay he was promoted to Sous Chef. In 2008 Stefan left The Lodge to take on the executive chef position at 20Nine Restaurant and Wine Bar. 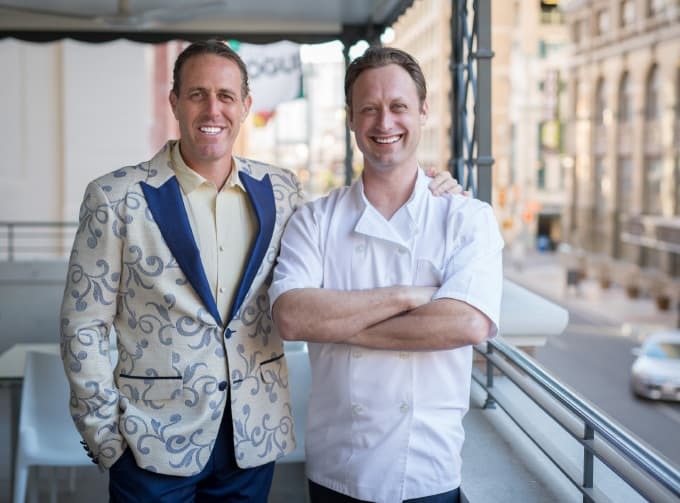 Three years into his role at 20NINE, an introduction was made between the chef and entrepreneur Andrew Goodman. In 2011 they opened FEAST in the heart of “Southtowns” King William district. It was an immediate success and is now considered a pioneer in the San Antonio independent restaurant explosion. The success of this partnership offered Stefan and Andrew Goodman the opportunity to open REBELLE in October 2015 inside Texas’s only Starwood Luxury Collection Hotel, The St. Anthony. Shortly after opening, REBELLE was awarded Best New Restaurant by Pat Sharpe of Texas Monthly, Top 10 Best New Restaurants San Antonio Magazine and Ranked #6 in the Express-News 100 Top Restaurants in San Antonio for 2016. With a newly rolled out menu, Rebelle is quickly becoming the new best restaurant in San Antonio. Are you ready to Rebelle? Experience the premium seafood restaurant in downtown San Antonio, TX. © 2019 Rebelle. All rights reserved.